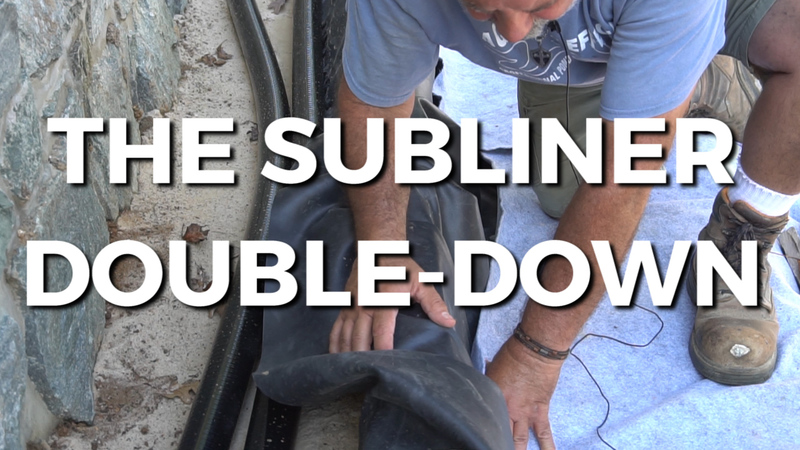 The Subliner Double-Down This is best thing to put down, and it will save you a lot of headaches in the long run. Hey, Webb’s Water Gardens! It’s Steve with Aquatic Effects. I’d like to point out a tip that gets overlooked a lot. As you can see on this project, we’ve got our liner, and you’re seeing the subliner material over it, which is this gray fabric. We like to sandwich our liner between those fabrics. We put down the subliner first, and then our liner, and then, as you can see, we’re putting more subliner overtop as we’re setting the rocks in place. The reason for this is safety. It’s an extra added layer of protection and it’s not that expensive. Furthermore, when going through a project of this size, having a small shard of rock cut a small hole through the liner would be disastrous, and almost impossible to find. Take the extra precaution, lay your subliner overtop of your liner, then you can apply foam, concrete, mortar, or whatever you need to finish your project the way you want to do it. This is best thing to put down, and it will save you a lot of headaches in the long run. When applying your subliner, when you get to your barrier wall and you can see that your liner is sandwiched between subliner and liner, keep in mind that your final subliner material should be below your water line, your highest point, so we don’t have wicking. The material will wick the water up and over. So, as you can see, we don’t have the subliner up over the edge. We are keeping it well below the water line. Very important tip to remember. If the rock doesn't want to sit on its own already, no matter what you put on there, it's always going to be subject to movement. Keep in mind, algae does have benefits, as it is a growing plant. If you're seeing a bubbling or foaming on the surface of the pond, more often at the base of your waterfall - this generally means there is an excess of proteins or dissolved organics in the water. If debris is left to build, the netting can easily become weighted down, ultimately collapsing into the pond. A check valve, or one-way valve is a valve that allows water to flow in only one direction, preventing flow from reversing.